A (semi-)mobile lead shielded 20 foot TB container commonly consists of an X-ray room, reception area and a mini-lab for the use of GeneXpert® machines. A solar power pack, internet connectivity, a fridge, UV light and air-conditioning can be incorporated. Fit for easy & safe Transport: As a standard sized 20 foot container, the unit is transportable by any truck locally available and is optimized for large scale prevalence studies or systematic screening programs in high risk groups such as people living in overcrowded areas, prisoners, mineworkers, PLWH etc. With a sophisticated - yet simple to operate - lifting device, the relatively low weight container is off-loaded from the truck and the X-ray system can be up and running in less than 1.5 hours. Because the Xray container is not permanently fixed on the truck, the unit can easily become operational in a fixed setting for TB screening as well. Energy supply: With the latest technology in batteries and inverters, the single phase (220 V) X-ray unit is capable of making, storing and sending approximately 200 images without the need for external power. Solar panels on the roof or a portable power generator that can be stored in the container can also be used to generate energy at remote sites. A refrigerator, climate control or a fan can be integrated in the container. The reception room contains the diagnostic viewer and PC and is separated from the camera room by led protected walls and door. The X-ray room contains the digital X-ray system that is fixed in the container floor. 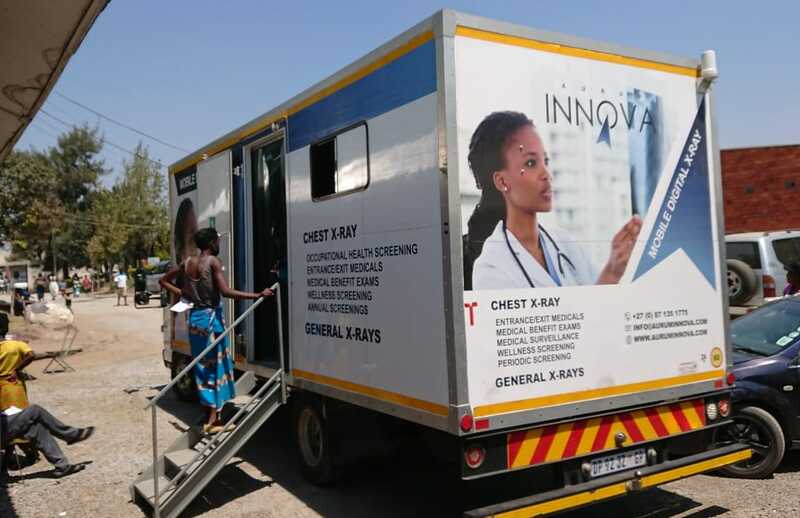 CIDRZ based in Lusaka, Zambia operates the mobile "One Stop TB" container concept with a (single phase) Direct Digital Radiographic system and a small laboratory for active case finding in high risk groups, such as inmates. This diagnostic container was awarded in 2010 a grant under the Stop TB Partnership/TB Reach call for innovative TB case detection proposals and ranked in 2011 first place on the impact analysis (presentation at UNION Conference in Lille 2011). The NTP of Rwanda operates a 2-compartment diagnostic container with Direct Digital X-ray to support its TB prevalence survey. A central archive and PACS software allow the NTP of Rwanda to forward all digital Chest X-rays including participant data over the mobile phone network as one compacted electronic file to a central database in Kigali for second reading and back-up. Data transmission per participant over the mobile phone network typically takes 35 seconds. Similar operational experience was reported from Ghana. 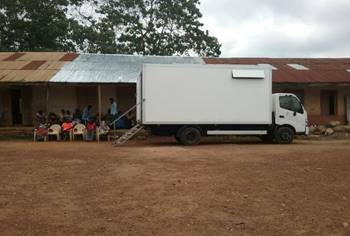 In an innovative TB project co-funded by the Governments of Ghana and the Netherlands, the Ghana Health Service/NTP implemented a nationwide tele-radiology network with 50 solar powered digital X-ray systems of which 2 are used in vans for outreach TB screening services (see below picture). The TB case detection rate in Ghana at the time the project implementation started - June 2016 - was estimated by WHO at 32% only. This project - including eHealth innovations such as CAD4TB - is expected to empower the NTP in more effectively finding the missing TB cases nationwide in support of the END TB Strategy. 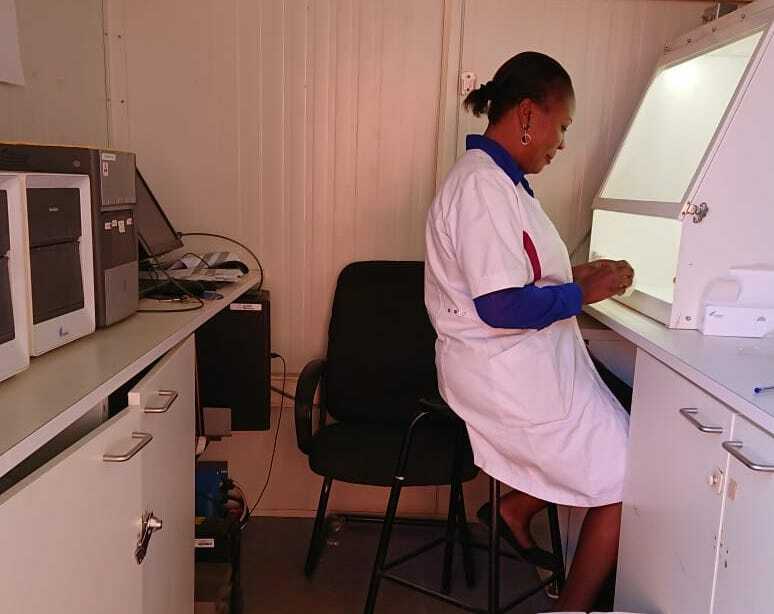 The NTP of Malawi has with Global Fund support since March 2018 seven “one Stop TB” screening units operational for active case finding using dCXR/CAD as rapid triage before Xpert® MTB/RIF. 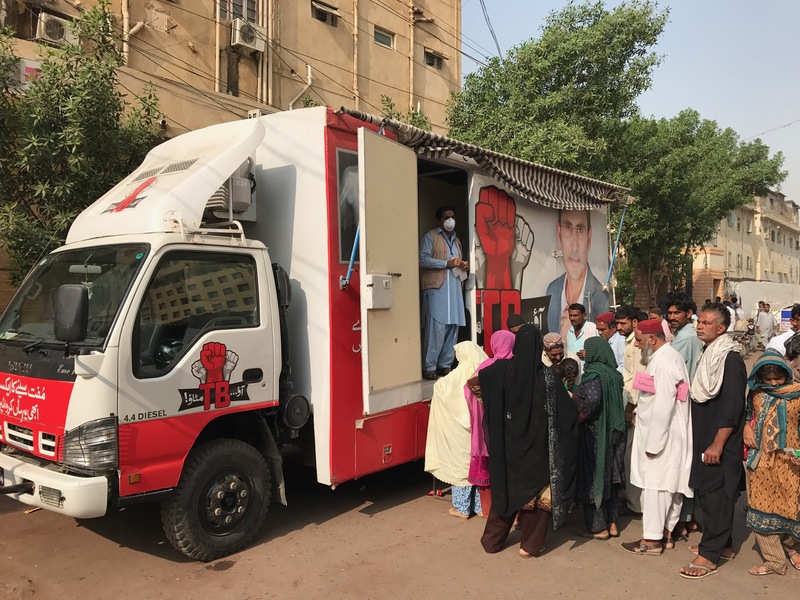 In the first 6 months of operation on average about 125 people are being screened for active TB per day per unit and this number is expected to rise. Based on the first results, a high yield is obtained by finding the missing people with TB most of which never visited a health facility for their illness. As next steps in the services to be provided by these “fast track” mobile screening units, Malawi considers to integrate HIV counselling and testing services, screening for hypertension and diabetes and targeting other towns and hot spot areas in the country. These solar powered screening units are considered an essential and high impact intervention in support of the END TB Strategy in Malawi. 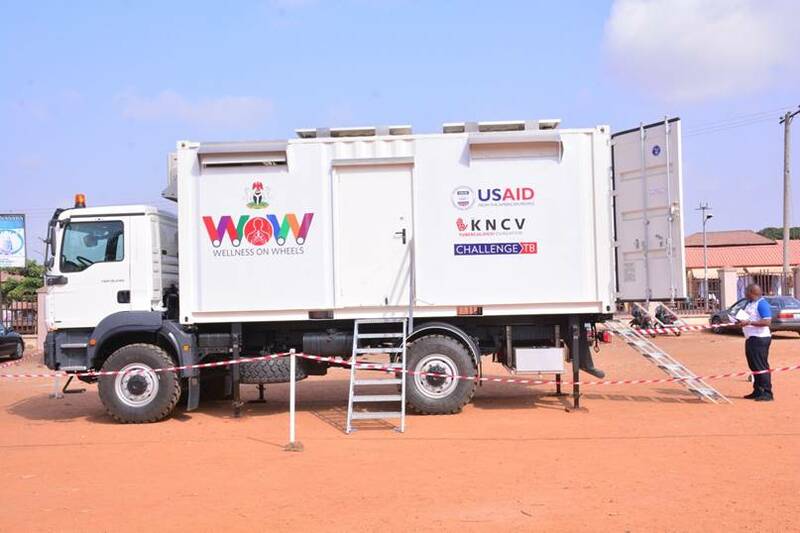 Wellness on Wheels (WoW) truck - used in Nigeria in support of finding the missing people with TB - includes: digital X-Ray/CAD and GeneXpert®, to bring high-quality “one Stop TB” diagnosis directly to densely populated areas. “With this innovative idea, we can diagnose TB within a very short time, at most, two hours, we can do x-ray using this vehicle, we can also detect TB cases using generic test, we will also know if the case is drug resistant type or non drug resistant type”, the Minister said. The Zero TB Initiative (ZTBI) is working across the world to create islands of elimination with strong local partners in high-burden areas. Screening for presumptive TB cases in e.g. Pakistan is done by IRD with support from mobile digital X-ray and CAD as a rapid triage before Xpert® MTB/RIF with a high impact on case notification. These portable digital X-ray systems are to be specifically designed for use in high ambient temperatures and elevated humidity settings like Africa or South East Asia. Such systems come with a more powerful (5-8kW) X-ray generator, allowing for high daily throughput and quality X-ray images at the lowest possible patient dose by minimizing exposure time. Since this year also a very compact portable system is available on the market that can be carried in a back-pack and operates reliably on batteries. To avoid having to adjust both the X-ray tube and the detector for every different patient height, both columns with tube and detector can be height synchronized and motor driven. Such construction and a 6-8 kW X-ray tube are critical for high productivity in the field and avoidance of overheating of the X-ray generator. Foldability of aluminium columns allow for easy transportation in any 4x4 using roller wheels and sturdy flight cases.